Posted in: Easter Bowl, Junior Tennis. 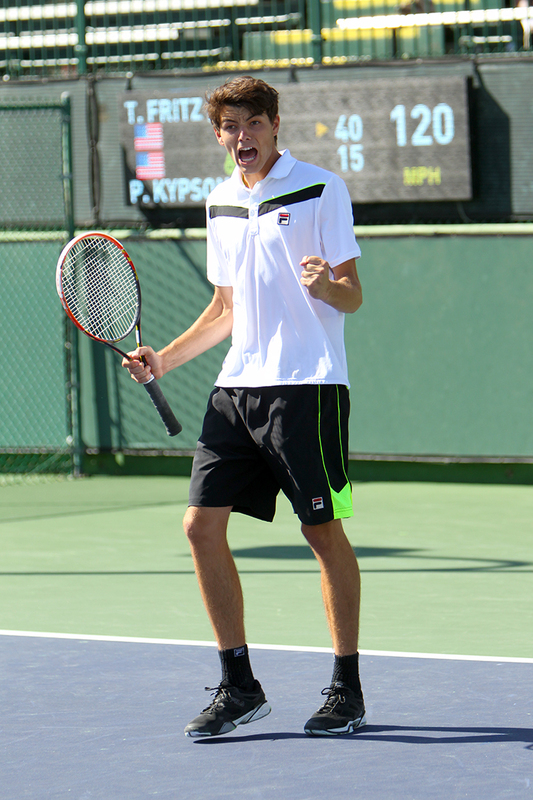 Tagged: 2015, easter bowl, indian wells, junior tennis, Taylor Fritz, usa. INDIAN WELLS, Calif. (April 9, 2015) – It looked pretty certain for a short time during play at the 48th annual ASICS Easter Bowl on Thursday that the event might lose its top-seeded player in the ITF 18s for a second consecutive day. Facing a 4-6, 0-5 deficit against 15-year-old qualifier Patrick Kypson from Greenville, N.C., the world’s No. 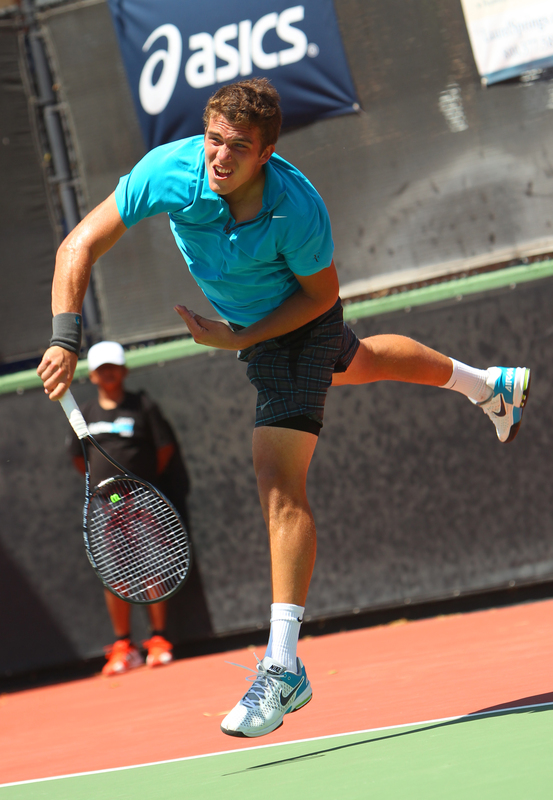 4-ranked ITF junior Taylor Fritz, 17, pulled off an amazing and improbable comeback to beat Kypson, 4-6, 7-5, 6-2. Fritz never faced a match point and said after the match he could not recall ever facing such a big deficit and coming back to win. He said Kypson was effective moving him around a lot, and exposing a mild ankle injury Fritz has been recovering from. Fritz broke Kypson’s serve for 5-1, and again at 5-3 and rallied off seven straight games to take the second set for the amazing turnaround. Girls’ 18s wild-card Caty McNally, who upset the top-seeded Girls’ 18s player Usue Arconada on Wednesday, was taken out by the unseeded Helen Altick of Monroe, La., 6-2, 6-7 (3), 6-1. No. 12-seeded Claire Liu of Thousand Oaks, Calif., had a great win over No. 7 Ingrid Neel of Bradenton, Fla., 7-5, 6-1, to advance to the quarterfinals. In the Boys’ 16s final on Friday, it will be top-seeded Oliver Crawford against No. 11 Brian Cernoch of North Bethesda, Md. In the Girls’ 16s final on Friday, it will be Natasha Subhash of Fairfax, Va., against Samantha Martinelli, the No. 2 seed from Denver. You can catch all the action on Friday live on http://www.easterbowl.com. Sponsors include: ASICS, Laurel Springs School, Indian Wells Tennis Garden, the Dent Junior Academy, the tennis website 10sBalls.com, USTA, The Old Spaghetti Factory, SCTA and Mind Matters Tennis. To keep up with all the ASICS Easter Bowl news, visit the website at http://www.easterbowl.com and check out the tournament on Facebook (www.facebook.com/EasterBowl) and Twitter (@asicseasterbowl). For more information on ASICS, check out: http://www.ASICSAmerica.com and follow on Twitter @ASICSAmerica. About ASICS America: Anima Sana In Corpore Sano, meaning “A Sound Mind in a Sound Body,” is an old Latin phrase from which ASICS is derived and the fundamental platform on which the brand still stands. 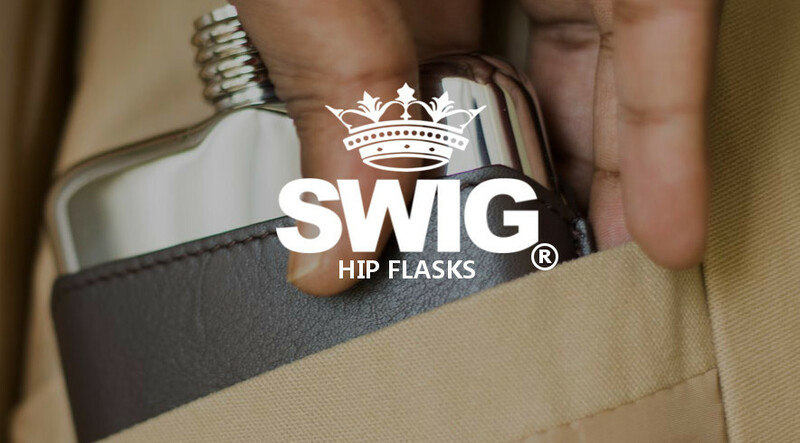 The company was founded more than 60 years ago by Kihachiro Onitsuka and is now a leading designer and manufacturer of running shoes, as well as, other athletic footwear, apparel and accessories. For more information, visit http://www.asics.com. Posted in: Junior Tennis. Tagged: 2015, adam neff, Asics, Caty McNally, easter bowl, junior tennis, Usue Arconada. INDIAN WELLS, Calif. (April 8, 2015) – The young and precocious shined brightest Wednesday at the 48th annual ASICS Easter Bowl. 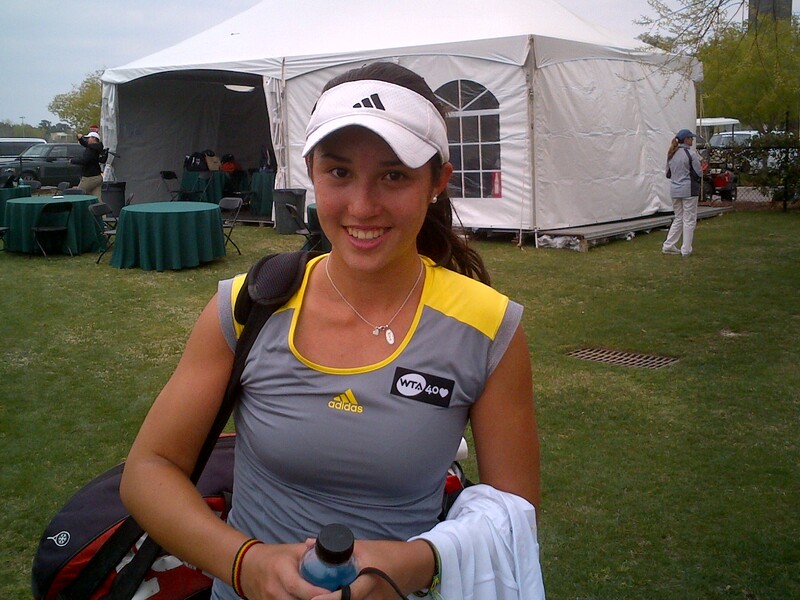 Wild-card entry and 13-year-old Caty McNally of Cincinnati shocked top-seeded Usue Arconada of College Park, Md., 6-4, 7-5, in the second round of the ITF Girls’ 18s singles being played at the Indian Wells Tennis Garden. Just one year ago, McNally was 12 and competing in the 14s at the ASICS Easter Bowl, losing in the quarterfinals and placing sixth overall. She then watched her brother John win the Boys’ 16s. McNally said it probably would be a day or so for the upset to sink in. “I just beat the No. 6 girl in the world, so it feels pretty good,” she said. “It hasn’t sunk in yet. Maybe it will tomorrow morning when I wake up. The finals of the USTA boys’ and girls’ 12s and 14s singles were completed on Wednesday with both 14s finals producing memorable matches. In the boys’ 14s final, 13-year-old No. 3-seed Adam Neff of Bradenton, Fla., came back from down 1-6, 1-4, to beat No. 10-seeded Jaycer Calleros of San Antonio, 1-6, 6-4, 6-4. Incredibly, Neff broke his strings in five of his Wilson rackets during the match and had to borrow a racket from someone in the stands at one point. He was actually leading 2-1 in the third with the borrowed stick before his coach scrambled to have more rackets strung. Neff said it was “extra special” to make his largest comeback in an ASICS Easter Bowl final the way he did. Past 14s winners at the ASICS Easter Bowl include: Gene Mayer (1969), John McEnroe (1973), Vince Spadea (1988) and Justin Gimelstob (1991). Roddick did win the 16s Easter Bowl title back in 1998. The Girls’ 14s final went down to the very end as No. 14 Whitney Osuigwe of Bradenton, Fla., came back from down 5-2 in the final set and saved two match points to beat top-seeded Alexa Noel of Summit, N.J., 4-6, 6-0, 7-6 (4). Osuigwe, who won the 12s at the Junior Orange Bowl in December, said at last year’s ASICS Easter Bowl she was up 5-2 in the third set only to lose in the 12s quarterfinals to eventual champion Kacie Harvey. “It feels great to win the Easter Bowl,” said Osuigwe, 12, whose father is a trainer at the IMG Academy in Bradenton. Hunter Heck, the No. 6-seed from New Brighton, Minn., beat Jameson Corsillo, No. 2 from Boca Raton, Fla., to win the Boys’ 12s singles, 6-3, 6-2. “I had a lot of nerves before the match but it goes away once I start playing,” said Heck, a 12-year-old seventh-grader who plays for his local high school tennis team. In the Girls’ 12s singles final, top-seeded Gabriella Price of Montebello, N.Y., took out unseeded Emma Jackson of La Grange Park, Ill., 6-1, 6-2. Price is currently working full-time in Florida with renowned coach Rick Macci in Florida. You can catch all the action on Wednesday live on http://www.easterbowl.com. Sponsors include: ASICS, Laurel Springs School, Indian Wells Tennis Garden, the Dent Junior Academy, the tennis website 10sBalls.com, USTA, The Old Spaghetti Factory, SCTA and Mind Matters Tennis. To keep up with all the ASICS Easter Bowl news, visit the website at http://www.easterbowl.com and check out the tournament on Facebook (www.facebook.com/EasterBowl) and Twitter (@easterbowl). For more information on ASICS, check out: http://www.ASICSAmerica.com and follow on Twitter @ASICSAmerica. What a week it has been for Mayo Hibi. The 17-year-old from Irvine, California is playing under the Japanese flag, but she’s every bit an American as I am. The 2013 Easter Bowl champ and USTA International Spring Champ won on Saturday, Sunday and Monday to clinch the US Open National Playoffs from New Haven. Yesterday, she won her first-ever US Open qualifying match, outlasting American Allie Kiick by a count of 6-3, 3-6, 6-1. It was a match that was nationally televised on CBS Sports Channel in prime time. Today, she plays Anastasia Rodionova on Court 10 in the fourth match of the day. Could she upset Rodionova for Win Numero Cinco? Hibi has never played Anastasia before, but she did play her sister, Arina, in Las Vegas last year. By the way, I learned to pronounce her name by remembering Cinco de Mayo. Whatever you do, DO NOT pronounce her name like the condiment. I’d like to think that Luca Corinteli and I have a few things in common. We both spent our high-school years as Alexandrians, we both love the Superbowl XXXXVII Champion Baltimore Ravens and we both love hitting the hard courts in suburban Maryland. Difference is, he’s a Junior Tennis Champions Center prodigy and I’m a weekend hack. The first few similarities pretty much got me through this brief interview with a major DC/Baltimore Future ATP contender after he had lost a three-setter for the 18s title at the Easter Bowl. On you taking Gage (Brymer) to the brink today in the Easter Bowl Final: Do you hope for any epic battles between UVA and UCLA? Playing against Gage today was definitely difficult. I really felt like today’s match was in my hands and being up 6-3, 3-1 and letting it go is tough to swallow. I know all of the kids going to UCLA in the fall and all the talent they have now so the next couple of years will really be competitive and fun between these schools. Hopefully, I can get revenge next year at the NCAA’s when it matters a little bit more. Haha! Are you looking forward to working under Coach Boland at UVA? What do you hope to learn and tell me about your looking forward to the team ethic. I am most definitely excited to work under Coach Boland and Coach Pedroso in Charlottesville next year. I know that these two coaches are the best in college tennis and they know what it takes to get me to the next level which is a professional. As far as being on a team, I am super pumped to represent the University of Virginia and play along many of my close friends. It is something I have never done and I feel like I could be a great teammate for those guys. Is it hard for an East Coast player at the Easter Bowl with an event that’s heavy on California talent and always an away game for East Coast players? I don’t think playing on the West Coast is too much of a disadvantage for me, at least. I don’t want to speak for other East Coasters, but as a very frequent traveler I have played in over 12 countries so I have gotten used to being out of my comfort zone and it is something I embrace now. Although you’ve trained in Boca, tell me about your time at JTCC and the DC talent you’ve met in training. I was at the USTA in Boca for 3 years and last September I went back to the JTCC. All of the coaches there are great and really know what they are doing with the future stars and people are already on the tour like my very good friend, Denis Kudla. I work with coaches Vesa Ponkka and Frank Salazar and I love every second of it. The JTCC will keep producing players because of how well they run the Academy. My sister actually went to TC and I would have gone there as well if I did not play tennis seriously. I probably would have been a tight end for the Titans. I don’t know if there is one memory I can single out as my favorite as being an Alexandria resident, but I love taking walks in the summer around Old Town with friends and family just because it is so nice. Also a Baltimorean here. How great was it to be the only tennis player who picked the Ravens when no one else did? I am so proud to be a Ravens fan. I knew it would be a difficult thing to do but the coaching staff and Ray Lewis really got all the guys playing really hard and it is something I’ll never forget for my whole life. I know the beginning of free agency looked bad for us but I like the moves we made and I think we will be contenders for a championship once again next year! —Steve Fogleman, with Big Ups to Steve Pratt and Dave Kenas, the photographer who provided this week’s visual smorgasbord. I’d be remiss if I didn’t mention Colette Lewis, who helped me discover respect for all things Easter Bowl. 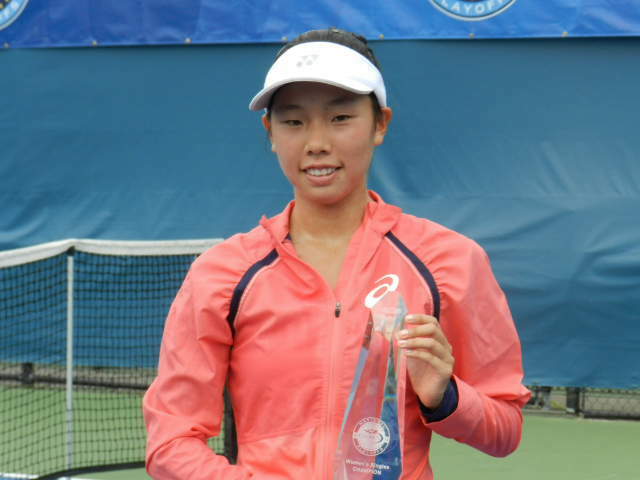 RANCHO MIRAGE, Calif. (April 13, 2013) – Mayo Hibi completed the ITF Carson-ASICS Easter Bowl double on Saturday, concluding a dominating two weeks of tennis with a 6-3, 6-2 victory over Tornado Ali Black. Irvine’s Hibi, who lost in the doubles semifinals on Friday, dropped just 14 games total in her six singles match wins during the tournament. Hibi said her game has really improved since she started working with former WTA player Debbie Graham, who won on hand to witness the victory. But Hibi was able to come back, using her consistent slice backhand to keep Black off balance for most of the match. Jaeda Daniel, the No. 3 seed from Port Charlotte, Fla., will also be celebrating with some ice cream following her comeback win in the girls’ 14s final for her first USTA gold ball as she outlasted Ashley Lahey, the No. 11 seed from Hawthorne, Calif., 3-6, 6-4, 6-1. “That was definitely the toughest match of the tournament for me,” Daniel said, adding that she would go out to dinner with her mom on Saturday night and then to Cold Stone for ice cream. Connor Hance of Torrance, Calif., overcame a match point in the boys’ 14s final to defeat top-seeded John McNally of Cincinnati, 4-6, 7-6 (3), 6-4. It was the second singles gold ball for Hance, who previously won the Clay Court National 12s. Serving for the match at 6-5 in the second set, McNally double faulted on match point to make it deuce and then Hance reeled off two more points to force the tiebreak. Top-seeded Sameer Kumar came back in his boys’ 16s semifinals to defeat Taylor Fritz, breaking Fritz who was serving for the match in the third set at 5-4. He faces Kalman Boyd on Sunday in the final championship match of the day. In the boys’ 18s final, Irvine’s Gage Brymer will face University of Virginia recruit Luca Corinteli. A UCLA recruit, Brymer is unseeded and has won four of his five matches in three setters. Saturday ASICS Easter Bowl sightings: former USTA President Franklin Johnson, Tennis Channel commentator and former ATP player Vince Spadea, former ATP player Chico Hagey and former WTA player Debbie Graham. Previewing Sunday’s main-draw singles matches. • Catherine is from Atherton in Northern California and is the No. 8 seeded at the ASICS Easter Bowl. 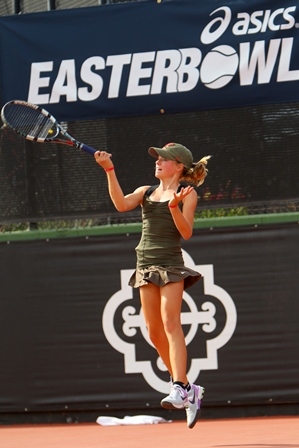 • She beat the top-seeded player in the 16s on Friday and the No. 4 seed yesterday in the semifinals. • Catherine was a finalist in the 14s division at the ASICS Easter Bowl last year. • Caroline is 14 years old and the No. 7 seed and from Hinsdale, Illinois. • She is coming off a great Carson event where she made the semifinals in the 16s. • Her sister Courtney currently plays for the UCLA Bruins. • Gage is from Irvine and is unseeded here this week and has won four of his five matches in three sets. • Gage won the 16s Division at the ASICS Easter Bowl in 2011. • He will play for UCLA in the fall. • Luca trains with the Junior Tennis Champions Center in College Park, Maryland. • Luca is the No. 3 seeded player and playing in his first ASICS Easter Bowl final. • He will play next year for the University of Virginia. • Sameer is the top-seeded player in the Boys’ 16s and is from Carmel, Indiana. • He won the Winternationals back in January. 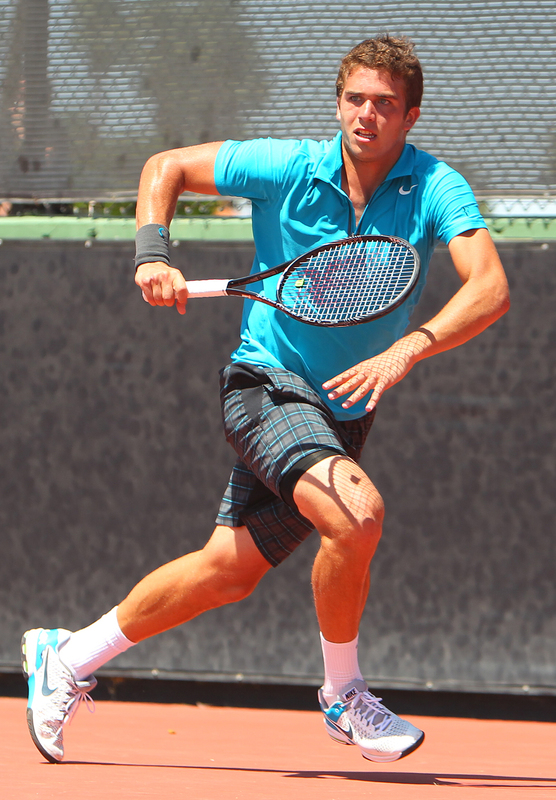 • Sameer is from the same hometown as ATP pro Rajeev Ram’s and the two share the same coach. 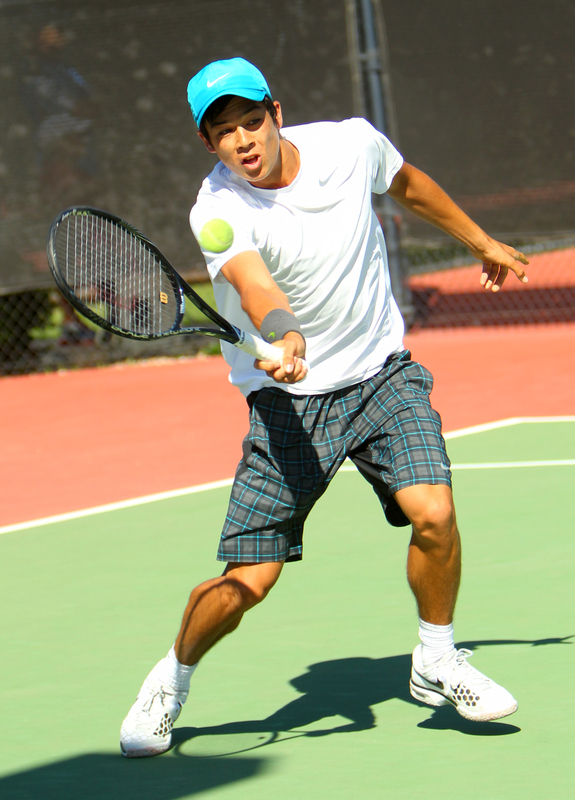 • Kalam is unseeded and from Rancho Santa Fe, Calif., and currently training at Advantage Tennis Academy in Irvine. • On Friday, Kalman beat the No. 2 seed dropping just one game. RANCHO MIRAGE, Calif. (April 11, 2013) – Future UCLA teammates and fellow Californians Mackenzie McDonald and Gage Brymer recorded convincing straight-set victories on Thursday in the Boys’ 18s division on Day 5 of the 46th annual ASICS Easter Bowl being played at the Sunrise Country Club. The No. 2-seeded McDonald of Piedmont, Calif., beat No. 15-seeded Dennis Uspensky of Atlantic Beach, N.Y., 6-3, 6-1, and the unseeded Brymer of Irvine, Calif., got past Henrik Wiersholm, the No. 14-seed from Kirkland, Wash., 6-2, 7-5, as both now move on to Friday’s quarterfinals. 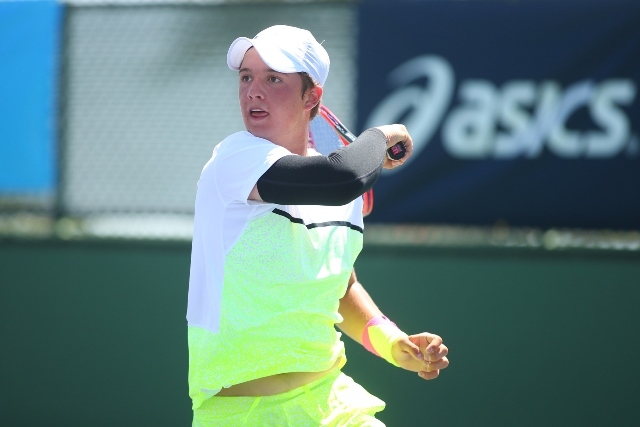 The defending champion and former boys’ 14s champion McDonald is looking to become the first back-to-back boys’ 18s winner at the ASICS Easter since 1971-72. McDonald, 17, next meets Martin Redlicki, the No. 5-seed from Boca Raton, Fla., while Brymer will face Michael Mmoh, the No. 8-seed from Temple Hills, Md. In the upset of the day, 13-year-old Ryan Peus of Carpinteria, Calif., beat 12-year-old and No. 1-seeded Claire Liu of Thousand Oaks, Calif., in the girls’ 14s quarterfinals, 6-2, 6-3. The two are training partners at the USTA Training Center – West in Carson, Calif.
Peus wore her sweat-stained Roger Federer hat with three signatures on the bill of the cap belonging to R-Fed, Novak Djokovic and Rafael Nadal. “It’s my lucky hat,” she said, adding she got all the signatures at the nearby BNP Paribas Open just down the road in Indian Wells. A 13- and 14-year-old both advanced to the semifinals of the girls’ 18s as unseeded Michaela Gordon, 13, of Los Altos Hills, Calif., beat Raquel Pedraza of Claremont, Calif., 6-3, 6-3, and No. 6-seeded Tornado Ali Black, 14, upset No. 2 Marika Akkerman in a nearly three-hour marathon, 6-4, 3-6, 6-4. Serving for the match at 5-4, Black was called for a time violation up 30-love but was able to close it out. “I got down 3-1 in the first set and was thinking, ‘she can’t keep this level up,’ ” said Black, who recently left training with the USTA and has began working with the L’Academie de Tennis Academy in Boynton Beach, Fla.
Louisa Chirico, 16, of Harrison, N.Y., and Mayo Hibi, 17, of Irvine, Calif., are the other semifinalists and both have WTA rankings with Chirico at No. 427 and Hibi at No. 368 in the world. Hibi had no problems with last year’s 18s finalist Brooke Austin, 6-0, 6-2. To keep up with all the ASICS Easter Bowl news, visit the website at www.easterbowl.com and check out the tournament on Facebook (www.facebook.com/EasterBowl) and Twitter (@easterbowl). For more information on ASICS, check out: www.ASICSAmerica.com and follow on Twitter @ASICSAmerica.